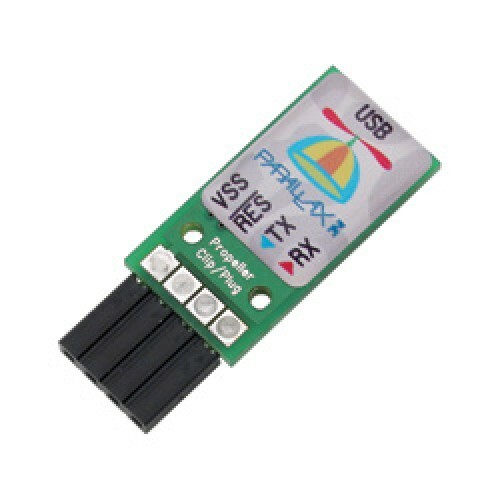 The Prop Plug provide a USB-to-serial port connection that is convenient for microcontroller programming and communication. These tiny devices are capable of asynchronous communication at up to 3 M baud with both 3.3-volt and 5.0-volt devices such as the Propeller and BASIC Stamp. The Prop Plug slips onto a 4-pin, 0.1" spaced header, allowing both PCB's and breadboards to provide in-circuit programming capability. Use the Prop Clip if programming with fewer components via a PCB edge connector is desired. The Propeller microcontroller is a multi-processing chip, with shared memory and a built-in interpre.. The Propeller module is a multi-processing chip, with shared memory and a built-in interpreter for p..